An electric breast pump is a handy tool for all breastfeeding mothers and a must have item for any breastfeeding working mom. If you plan to pump more frequently than once a day than an effective device will save you a lot of time and help maintain milk production. Since the first home-use electric pump was introduced over 20 years ago huge progress has been made in terms of efficiency and safety. Modern electric breast pumps come in various shapes and their features are often based on recent medical discoveries. The price of different units also varies significantly. 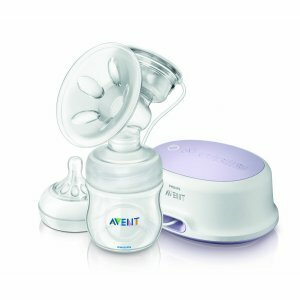 In order to help you choose the best electric breast pump for your needs we prepared a short summary of available devices along with a buying guide describing important features and practical tips. Two modes (stimulation and expression). Medela is the most popular breast pump manufacturer in the world and the first company that brought electric breast pumps to individual customers (before you could use them in hospitals only). Their Pump in Style pump draws on the years of experience. It’s widely praised for its reliability and often recommended by satisfied users. The motor of the pump has two ports for tubing so you can pump two breasts simultaneously. If needed one port can be blocked and the pump can be used as a single breast pump. Next to the ports is the vacuum control knob which enables you to adjust vacuum to your needs. This will not only make the use of this pump optimally comfortable but also help you to speed up the expression, if you want to. There is also a plug on the front side of the motor where either an AC adapter or a battery pack can be connected. The battery pack takes 8 AA batteries and lasts for about 15 sessions. A useful feature of Medela Pump in Style is the mode button. As you start pumping the device will work in simulation mode in order to trigger the letdown reflex. After two minutes it will automatically switch to expression mode. If you start expressing earlier than the default two minutes you can just press this button to manually switch into expression mode. There are two downsides of this pump. Firstly, it’s an open collection system. This means that there is a possibility of contaminating the tubing, as well as the inside of the motor, with milk particles that were sucked with the vacuum. These particles along with moisture may cause bacterial and fungal growth inside the motor. This poses a risk of contaminating the milk as there is no physical barrier between the inside of the pump and breast milk. Another drawback of this pump, that some moms find hard to deal with, is the sound of the pump. It’s not particularly loud but for some babies it may be problematic, especially at night. This pump features a closed collection system which makes it very hygienic and protects the precious breast milk. Thanks to a special membrane at the back of the flange there is no contact between the air in the tubing and the liquid gold. A simple, yet effective, feature makes Spectra S1 a leader in terms of safety among other electric breast pumps. In terms of efficiency Spectra’s pump is also one of the best devices on the market. It can create vacuum in the range between 0 and 320 mmHg. This means that the pump is very flexible and would suit various needs. Due to high upper range of the vacuum it can easily sustain milk production and even establish supply, which is great for moms with preemies. It’s quiet. 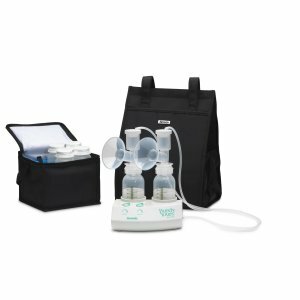 Spectra S1 is regarded as the quietest electric pump on the market and in this regard can only be compared to manual breast pumps. You will definitely be able to make phone calls or watch TV once pumping with Spectra S1. Even pumping at night should not be a problem as the quiet motor is unlikely to disturb a baby or anyone in the room. What makes this pump even more convenient in use is the build in LCD screen with a back-light and an automatic timer. Those features are particularly handy while pumping at night. With Spectra S1 there is no right to wake anyone up by the lamp as the LCD light will suffice to set up and turn on the device. It will automatically stop after a predefined time which eliminates the need to set up a loud timer/phone that may wake up the baby. The weak side of this product is the lack of a bag/case provided with the pump. This is surprising as most electric pumps come with a designated case or a special backpack. Ameda’s electric pump is quite popular choice among online buyers due to its competitive pricing. It offers closed collection system which which makes it a safe solution for a baby. It’s not, however, as strong as pumps made by Medela or Spectra so if your priority is efficiency look elsewhere. For those who seek a reliable solution at reasonably low price Ameda Purely Yours would be an ideal fit. This pump features both stimulation mode and expression mode. Similarly to its competitors it offers adjustable levels of vacuum and speed. By adjusting those setting you can make the pump be optimally comfortable. In this regards there is no real difference between Ameda’s pump and high end devices. A handy feature of Ameda’s pump is a built-in holder for bottles. Once you finish your session or have to take a break you can place the bottles in there. Thus, there would be no risk of spilling the precious content. For those who travel a lot and not always have an electricity socket at hand while pumping a build-in battery compartment can be a lifesaver. The pump runs on regular AA batteries so you don’t need to remember about charging it upfront. A set of 6 batteries will last for over two hours. Ameda’s pump is relatively loud in comparison to other electric pumps. In fact it may not be the best idea to use it in the same room with a sleeping baby. 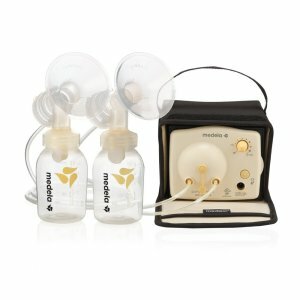 According to many moms Ameda’s pump is much louder than Medela’s Pump in Style. This is the most comfortable electric breast pump on the market. The philosophy behind this design is that it has been scientifically proven that the more relaxed and comfortable you are the more milk you can express. Designers at Avent laboratories when creating this pump were focused primarily on comfort (hence the name). Inside the flange there is a special silicone cushion with groves and textured petals. Its role is to massage your breast while you pump and thus stimulate more effective milk flow. It also makes the whole pumping experience more comfortable. Additional comfort is provided by the unique design of the pump that enables moms to pump in comfortable upright position (not leaned forward as with most pumps). This was achieved by constructing the collection part of the pump in the way that the milk is directed into the bottle while you sit upright. In contrast to many other pumps no suction loss or milk spillage occur during pumping in most comfortable position. Avent Single Electric Comfort pump is easy to clean and assemble. There are only 6 parts that comprise the whole collection apparatus. The assembly is intuitive and quick. This pump features two expression modes. Once turned on the stimulation mode is activated and it lasts for as long as you feel its necessary. After the letdown you can switch to expression mode by selecting one of three vacuum settings (low, medium and high suction). There are five buttons on the top of the motor. First from the left is the on/off button, followed by stimulation mode button and three expression mode buttons. All of them have back-light that enable easy operation even at night. The main drawback of this pump is its loudness. It is noticeably louder than competitors. It may be problematic to use this pump with a sleeping baby in the same room. built-in battery compartment for 4 AA batteries. This double electric pump is very popular due to its low price tag. Unfortunately it also has surprisingly high number of worst grades by customers who bought it on Amazon. Nearly ¼ of customers who left a review had serious issues with this pump. Most of them complained about the durability issues. 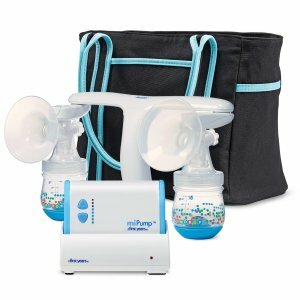 miPump unique feature is a special handle that enables holding both bottles in one hand. As a result one is able to use the other hand to tend to the baby or do other things while pumping. This is almost as good as a pumping bra. Customer service is very responsive and quickly send replacements if needed. 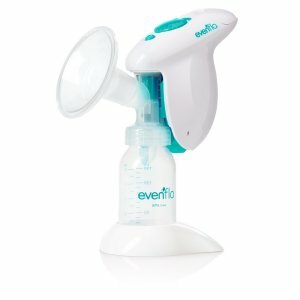 Evenflo SimplyGo is the best electric breast pump for occasional use. It’s not as strong as competitors nor has that many settings, but its reliable and gets the job done. Many moms use it during travel. It is also recommended for women who exclusively breastfeed and from time to time would like to express some extra breast milk. The excellent prince (below $40) makes it a great additional pump even for those who use other pumps as a primary expression system. The design of the pump is very compact. There are no tubing and motor is simply screwed onto the flange. On the top of the motor is a power button and a knob to regulate the suction power. AC adapter can be connected to the port at the bottom of the unit. When working on battery the suction is not as strong. The battery itself is enough for one pumping session. It’s not a pump for frequent use! If you plan on pumping several times a day you should consider other models. This pump was designed to be used occasionally. It is very portable and can substitute your main pump during the travel. SimplyGo will not, however, maintain supply so make sure to use it according to manufacturer’s instructions. What to look for when buying an electric pump? It’s hard to say which is the top electric breast pump on the market as the needs of individual mothers are rarely the same. For some the speed is the most important factor, others put safety above anything. There are also moms whose primary reason to use a pump is to stimulate lactation and maintain or increase breast milk production. Below are some important characteristics of electric breast pumps. Our recommendation for those looking for a perfect electric breast pump would be to find a pump that is good tasks which are most important for them. Speed and strength of the motor. The stronger the motor the faster milk flows. High end devices (Medela, Spectra) comes with such powerful motors that you would most likely operate on low settings. Let-down effect stimulation. This is important feature to start the milk flowing. By operating frequently without too much suction the pump mimics how the baby behaves just after latching onto the breast. This stimulation is aimed at triggering the letdown reflex. Most electric pumps come with this feature and enable you to switch into regular expression mode once the milk is flowing. Expression directly into the storage bags. Some moms like to collect milk directly into storage bags. There are pumps that comes with special hooks near the flange for attaching the bag. Proponents of this method are usually among mothers who freeze their milk. Ease of use. The pump should be easy and intuitive in use. You need to realize that you will have to clean and assemble the pump quite frequently. The rule of thumb is the less parts the better. Loudness. Quiet pump is better if you plan on pumping at night with a partner and a baby in the same room. On the other hand some moms are happy with louder pumps when they use it at work. The sound of the pump may let others know about you sitting in a break room and pumping and prevent awkward situations. Comfort of use. The shape of flanges and the material they are made with have huge impact on the overall comfort of use of a given pump. Most pumps on the market come with ergonomic cups that fit well. However, it is important to choose a proper size of the flange for your breast size. If a default size that is provided with your pump is too small or too large make sure to order a suitable replacement. Safety. Safety is of court very important. The materials used in pumps are tested and safe for babies. Plastics that have contact with milk is BPA-free. Some pumps are, however, safer than others. The close collection system pumps are more hygienic as there is no possibility or the direct contact between breast milk and air from the tubing.